As I mentioned a while back, my sister and I once wrote a song called ‘Wind Sand and Stars’ because this book was on a shelf nearby when we were trying to come up with ideas. We liked the title, though neither of us had read it. The first thing that struck me coming to it now was that the French title is Terre des hommes, which is clearly nothing like Wind, Sand and Stars. It seems a harder title, prouder, more (literally) grounded. Wind, Sand and Stars is more awe-struck, and is appropriate in different ways. It seems to say that the physical world is beautiful, wild and immense, whereas Terre des hommes, assuming this, stakes humanity’s claim to it – if not to controlling it, at least to appreciating it. And appreciating nature, and nature’s wildness, is something Saint-Exupéry sees as essential for... what? Certainly for his own happiness. When he tries to argue out from this point, that it is essential for mankind that some of its number take on storms and deserts – not for the practical benefits this can bring, but for its own well-being (almost its spiritual well-being), he loses me somewhat. But watching him get there is pretty inspirational, and it is both a tougher and a more ornate book than I was expecting. Spectacle, like crime, is not interesting. Or at least not for very long. So what does endure? This is great too, a fine description of the anxiety one can feel as a child that adult life can only intrude and make things worse. But what is the connection with flying? 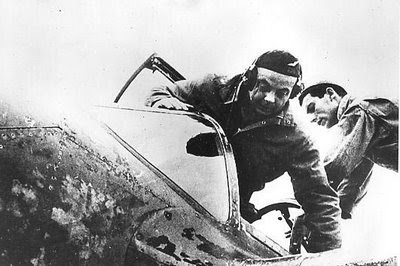 Consciousness and inspiration seem to be Saint-Exupéry’s true subjects, and it is almost incidental that the thing which inspires him and heightens his own consciousness is flight. Several times he tries to forge a link by saying that this or that spectacle is as nothing to the imagination of a little girl. That he can’t bear to be grounded for any length of time suggests that he is being disingenuous when he says ‘it isn’t a matter of living dangerously.’ In his introduction William Rees says of Louisa de Vilmon’s attitude to the author when they were lovers: ‘She found him impossibly intense and demanding’ (p. xi). To some extent this is how I found his book, but its vitality makes it an engaging read. Do you work in an office? Have you ever felt something like this? I don’t want to paint, particularly, but I wouldn’t mind singing a bit more than I do, and writing things to sing. But somehow it just doesn’t come together when I’m working full time – evenings and weekends aren’t enough. Elsewhere in All the Conspirators, Philip’s mother suggests that they should be quite sufficient for his purposes, as though his writing and painting are hobbies: pastimes to fill an idle hour, rather than work in their own right. Because he doesn’t get all creative the moment he arrives home he she thinks he can’t possibly be serious about it. But there are two things which could be happening here: he could be lazy, or it could be that the things he wants to do require more alertness, concentration and time than is left over at the end of the working week. Philip is certainly convinced that he has the talent, but he also caves in rather easily, leaving off his writing just so he can show Mother that this is what employment does to him. Maybe if he could blog, that would be an acceptable compromise – but, it being the 1920s, he can’t. What is really disturbing through all of this is that the Wrong People are in charge: it is Victor, his father, and Mrs Lindsay (Philip and Joan’s mother) who cause all of the events in the book. The likeable characters – Philip, Joan, Allen, Currants – are totally ineffectual, and ultimately Philip’s art descends to the level of kitsch that is the limit of his mother’s comprehension. 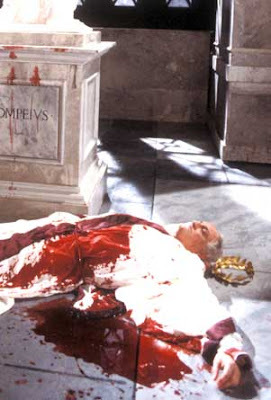 Maybe All the Conspirators is a greater tragedy than it seems. Sorry, I was miles away. Googling ‘Moomin’, finding a whole franchise of which I’d only been dimly aware until recently. Brought about largely by the garish Japanese cartoon from 1990, which triggered what Wikipedia alarmingly calls ‘The Moomin Boom’. Poor Moomin! To suffer commercialisation, to find himself modelled in plastic, printed on t-shirts, emblazoned on the side of Finnish aeroplanes. Surely all of that would only embarrass him? There has also been a counter-boom, bringing him back down to size. There is a 2003 album of songs which ‘became the core for Moomin music in the 1950s and 60s on the theater stage’ (what did the music accompany? The website doesn’t say). There are these Drawn and Quarterly reprints of Moomin as a daily newspaper strip in the 1950s, which I found through Anne Bacheley’s infectiously enthusiastic blog posts about their French translations. Also worth mentioning is the pre-boom Polish stop-animation TV series which I can just about remember from its second UK screening in 1986, though I didn’t like it much then, probably because it wasn’t Battle of the Planets or Knight Rider. Watching it now, it actually is rather lovely, like The Clangers on a bigger and greener planet. The comic strips ran in The Evening News between 1953-9, until, as Alisia Grace Chase’s afterword says, Jansson ‘realised that the gruelling schedule of a daily and being creative on demand did not suit her meandering attitude towards life’. You wouldn’t guess it from reading them. The daily comic strip is usually quite a constrained medium: its three or four panels make it suitable for short gags, and though its regularity makes continuity possible, you can never be quite sure that your reader saw yesterday’s strip, so each episode also has to make sense in isolation. Maybe there are other examples, but it’s the first time I’ve seen entire stories told in this way (both of these books contain four). They are picaresque tales, loose and episodic, and... the trouble with writing about them like this is that for one thing I’ll only end up boxing them in when they should be free to fly, and for another, it avoids the main thing I want to say, which is that these are the best comic strips I have seen since Douglas so magnificently responded to my request that he find me something jangly to read by producing some extremely rare volumes of Krazy Kat in about 1998. What links these two stories is the satire on the idea of achievement which Mr Brisk and the Prophet share. Mr Brisk is too absorbed in sport to notice the people he impresses whilst doing it (or anyone at all, except competitors who beat him), so what good can it really do him? The Prophet takes an idea, freedom, and wants to see it quantified. It’s as though he’s a government inspector, checking up to see that everyone is sufficiently free – which, as Moominpappa’s justification for staying up his tree implies, is a nonsensical view of freedom. Moominpappa has many nonsensical views. He is the least self-aware character, the most endearing, and the funniest too (I laughed for days at his insistence during ‘Moomin on the Riviera’ that his family refer to themselves as the De Moomins). Taken on his own he is just as flawed as Mr Brisk or the Prophet, but the point about him is that he isn’t on his own, he is part of a family and a community which wouldn’t work nearly so well without him. 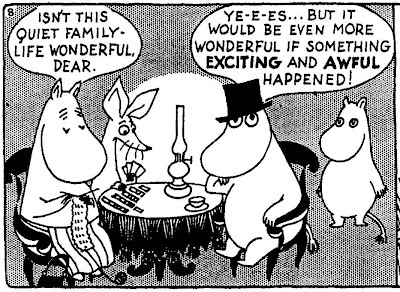 This is the great thing about the Moomin stories: they draw you in to the fond family circle, but they do it lightly, there’s no obligation. Relax, don’t do what you want to do, be where you feel at home.